No one wants a broken leg! In the past, fresh snow would be wiped away so people would not face slipperiness in front of their doorsteps. Nowadays road salts are used to combat slipperiness but road salts are damaging to the environment and road salts will stain your expensive flooring resulting in white stains that never can be removed. A hospital and or care center will have intense “traffic” during a winter day. To avoid injuries but still avoid staining to floors, IceMelz eco is the best solution to combat slipperiness and protect habitants, patients and visitor against injuries. And IceMelz eco will not stain the expensive flooring. 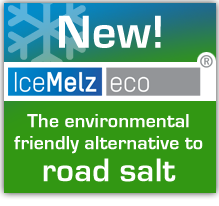 Especially hospitals and or care centers with many senior and limited mobility citizens are in need of an adequate quick combat against slipperiness, IceMelz eco is the efficient environmentally friendly solution! That’s why: use IceMelz eco during the winter months to avoid and/or prevent slipperiness around hospitals and care centers!